33" pontoon lounge seat in our Premium design with exclusive Roto-Cast Plastic bases & backs. Whether you’re purchasing our Premium, Elite or Platinum seating rest assured that all of our bases are made from Roto-Cast Plastic and offer full storage with a sealed raised bottom with recessed water channels which divert the water away from stored items and sends the water out drain holes in the back of the base unit. Water cannot pool at the bases or become trapped in the storage area. When using fence/rail risers, water drains off the pontoon boat eliminating mold and carpet/deck damage. Our backrest construction starts with a Roto-Cast Plastic solid frame, which is secured to our bases with stainless steel screws. 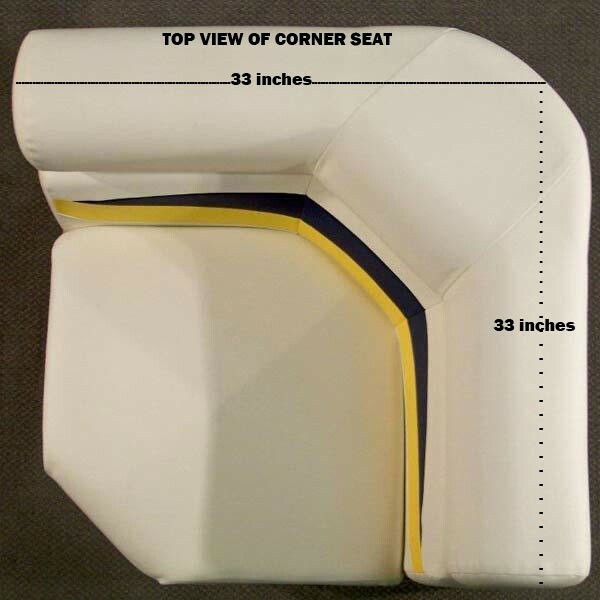 5” marine foam is used on the backrest roll and center insert cushion, plus a wedged 5 to 3” seat cushion for superior comfort and support and the wedge cushion diverts water off seating to prevent pooling on vinyl again helping to eliminate mold and rot. We use high quality marine grade vinyl that is formulated to be mildew resistant and contain the necessary Ultra Violet (UV) additives to meet or surpass industry standards. Lifetime warranty on all Roto Cast plastic bases & backs. When purchasing this item individually, shipping will need to be added. Call for a freight quote.